The collection raised a total of £778, contributing to a total of £1000 forwarded by the Club to water survival boxes. World Water Works (www.worldwaterworks.org) is a Rotary charity which sends the boxes costing £150 each, containing filter equipment to provide clean drinking water along with practical tools and materials, direct to Rotary Clubs based in disaster areas for distribution. 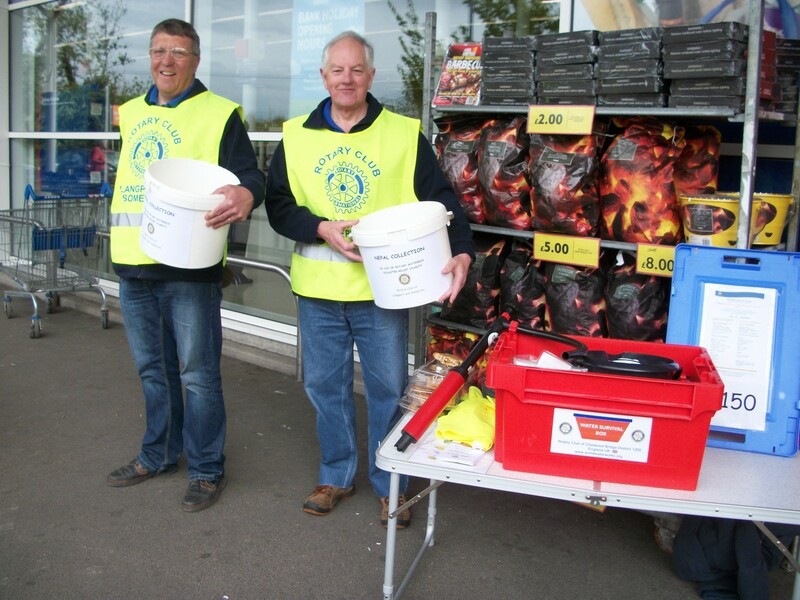 The Rotary Club sincerely thanks Tesco for its immediate positive response to the request for a Rotary collection and its customers for their exceptional generosity. 500 water survival boxes are already in transit to the Nepal. The World Water Works charity has no paid employees and boxes are packed by volunteers. Humanity First UK (one of our regular aid agencies) are considering sending a team to assist. We have offered the bulk of our current stock of packed Water-Survival Boxes (providing they can cover the cost of air freight). We expect a decision from HFUK in the next day or so. The alternative route would be via Rotary District 3292 that includes Nepal. Funds are urgently needed to cover the cost of air freight for the existing stock and to pay for more boxes that may well be requested given the scale of this disaster. In order that we can continue to respond at the same level to future disasters we need sustained funding in the order of £150,000 – £200,000 each year. The standard box containing a Grifaid Aquafilter Family water-purification kit and other essential survival items costs £150. This covers the cost of the box, contents, and air freight to the disaster area. The new water purification kit is designed to supply 100,000 litres of clean water for at least 3 years if used 24/7. As all the work involved in running the project is provided by volunteers donations are applied to the costs of the box, water-purification kit, other essential survival items and the air freight charges to ensure the aid reaches families in need in the shortest time possible. We hope all Rotary and Inner Wheel Clubs can support our endeavours by donating the cost of two boxes (one in the case of Inner Wheel Clubs) each year. Demonstration Boxes are positioned in most Rotary Districts for use by local Clubs and where none can be located we can supply – email back to me please.